I’M SERIOUSLY YOU GUYS, ONE PERCENT. YOU GUYS. IT’S BEEN GOING FOR OVER 60 HOURS AND IT’S ONE PERCENT COMPLETE YOU GUYS. This entry was posted on Wednesday, June 3rd, 2009 at 12:09 pm and is filed under Blog. You can follow any responses to this entry through the RSS 2.0 feed. Both comments and pings are currently closed. 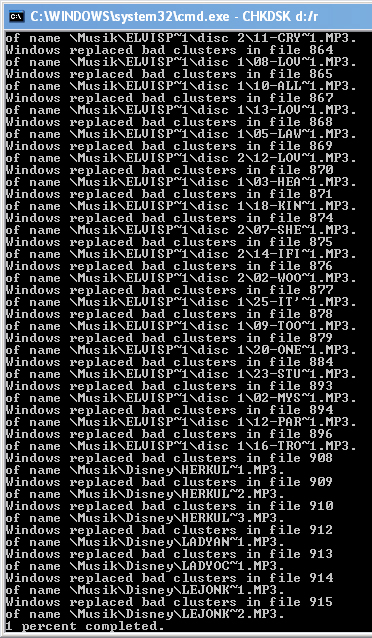 Control c will cancel – when you get that far (time wise) and it’s only at 1% the drive is essentially dead. You can reformat but that only delays the inevitable. Replace the drive ASAP. After you format you may see a whole bunch of bad blocks. That means those blocks were marked bad by the file system and that usually means your heads crashed and marred the surface of the hard disk. Get a new disk! It will likely get worse and may fail outright.